During the Year of Mercy Pope Francis gave a catechesis on the Corporal and Spiritual Works of Mercy at his weekly audience. On one Friday each month, Pope Francis showed what these Works are in a very special way. It is worth recalling those Fridays of Mercy. 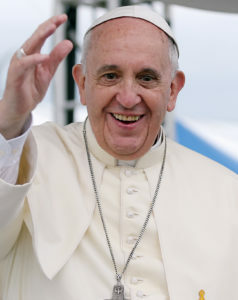 January: Pope Francis visited a retirement home for the elderly. February: He met people suffering from drug addiction in a centre in Castel Gandolfo. March: He celebrated Mass, with the washing of feet, on Holy Thursday at a refugee centre. April: He travelled to the island of Lesbos and met migrants and refugees. May: He visited a community of people with severe mental disabilities at Ciampino. June: He met with two groups of sick and elderly priests. July: While at WYD in Krakow, he paid a visit to a paediatric hospital and also went to Auschwitz concentration camp, where he stood in silent prayer. August: He met women rescued from prostitution. September: He visited sick infants in San Giovanni hospital and also paid a visit to a hospice. October: He visited an SOS village in Rome which cared for children in family or social crisis. November: He met with families of priests who had left active ministry. Friday would be a special day to promote the culture of mercy! Click here for more features and content from our February issue of Intercom.